The Walbeck Elite played in the second day of the Zoots Tournament. In the first game, they faced the AZ Zoots. At the plate, Jack was 0 for 1 with a walk and a strike-out. In his first at-bat with Trevor at third, they tried to run a sucidic squeeze. The pitch was in the dirt for a ball and Trevor was picked off at third. Jack eventually walked on five pitches. He was out on an inning ending double play by Sam. After taking two called strikes, Jack struck out swinging in his second plate appearance. In the field, Jack played right field. He had three put-outs and handled four other hits to right field. Child pitched and struggled with his control. Managing only three hits, the Elite lost the game by the score of 5 to 1. The scorebook is here. By three hours between games, Jack and I had lunch and wandered to West Coast Sports. The Elite played Lamorinda in the second game of the day. At the plate, Jack was 0 for 2 with a walk and a fielder's choice. In his first at-bat, Jack fell behind 0 and 2. He took a ball, fouled off a pitch, took another ball, fouled off two more pitches and then drew a walk. He ended the inning there after Ryan flied out and Trevor struck out. Jack hit a 0 and 2 pitch for a hard ground ball right at the pitcher. The pitcher made a nice stop and forced Sam out at second. Jack was safe at first. He ended the inning there when Ryan flied out. In his third at-bat, Jack grounded a 0 and 1 pitch to the second baseman and was thrown out at first to end the game. In the field, Jack played right field. Although he handled a couple of balls to right field, he didn't have a put-out. The scorer charged him with an error. In a hit to right field, a runner was trying to score from second. Jack threw to Aaron at first as the cut-off, but the catcher yelled for him to let it through. The catcher didn't field the ball and they charged Jack with an error on the throw?!? 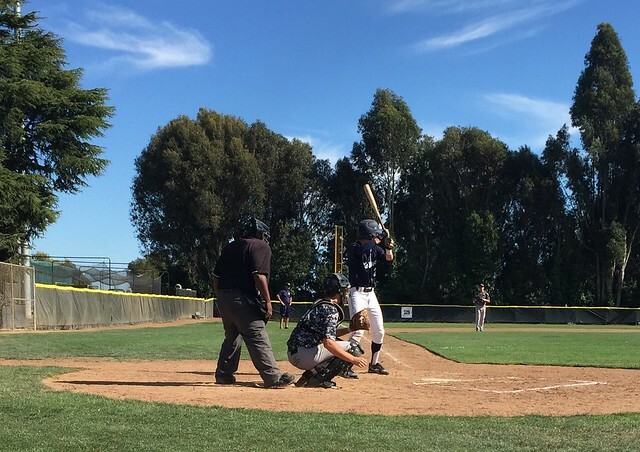 Although Lamorinda only managed three hits, the Elite shortstop committed four errors. The Elite lost the game by the score of 5 to 2. The scorebook is here. For the summer season, the Elite have a record of 2 win and 8 losses. The game log is here. Although the Elite will be playing a consolation game on Monday in Pittsburg, Jack is not available. This is the last game Jack is going to play this summer. He is heading to UPenn for the Wharton Sports Business Academy next weekend.